There are hundreds of lesser known temples in Chennai. 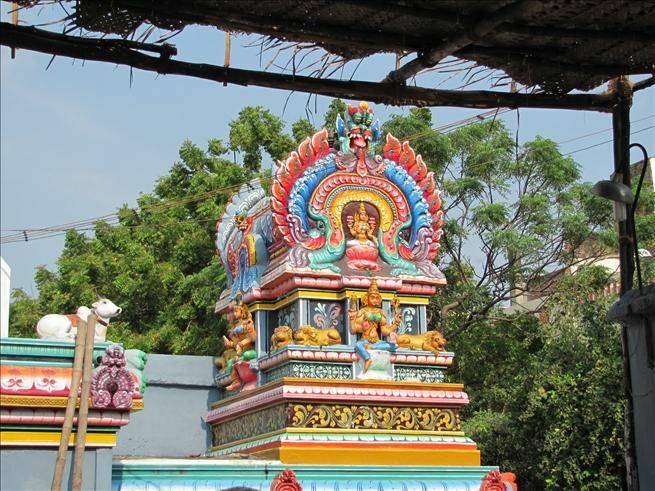 Few ancient shrines in Mylapore are still lesser known even to literate Chennai locals. You may easily miss the Virpaksheeswarar Temple, an in shadow ancient Shiva temple in Bazaar Road, Mylapore. Don't miss this temple if you happen to cross Mylapore. This oldest living temple in Mylapore is not very big and even disfavoured for its lesser scale architectural features; yet its history and epigraphy earn an important position among Mylapore Shiva temples. Sri Venkatesh Ramakrishnan was very keen in motivating and guiding the CPW team to visit the most blissful and sacred temple in the heart of the city. Best to visit these Shiva temples with someone knowledgeable about Chola history. 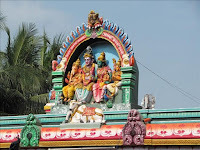 After visiting Madhava Perumal temple we proceeded towards the busy Bazaar street and passed through the Karaneesvarar temple to locate Virpaksheeswarar Temple. We found the western gateway (A Torana Vayil ornated with stucco images of Shiva and his consort). However the new main gateway or rajagopuram is at Virupakshishwarar Sannidhi Street (off Bazaar Road). Sri Virpaksheeswarar Virupa + Aksha Virupa means strange or ‘Contradicting the Nature’ and Aksha means Eye i.e., Three eyed Lord Shiva. Term refers the THIRD EYE of Shiva. The Shivalingam, representing the three eyed Lord. 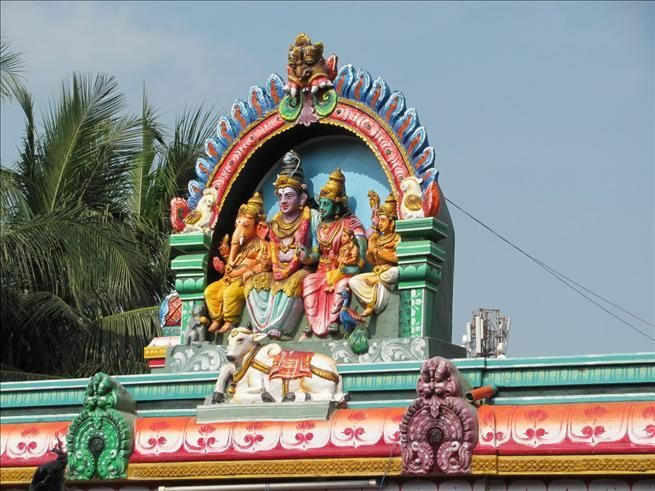 is considered as huge among the seven Shiva shrines of Mylapore. The temple complex includes the main sanctum, sanctums devoted goddess Vishalakshi (consort of Lord Shiva), Selva Ganapathy, Murugan, Chandikesvarar and Navagrihams. The corridor is spacious. The main shrine comprise pillared mukha - mandapam, ardha - mandapam and the main sanctum. Lord Virpaksheeswarar appears in the form of huge Shivalingam under the east facing Dravidian vimana. The ornate pillars of the mandapam support the plain roof. The level of the granite floor is raised and covered with modern granite slabs. As a result the bas relief images on the square faces of the pillars have got sunk below the floor level. The most affected bas relief image is one Sivanesan Chettiar, who reconstructed this historical shrine. He was the contemporary of saint Thirugnana Sambandar (Thevara Moovar), who lived around the 7th century A.D. Saint Thirugnana Sambandar restored the life of the young girl Poompavai, the daughter of Sivanesan Chettiar. Sometime back the girl died due to snake bite and Sivanesan Chettiar preserved her ashes in an earthen pot. Thirugnana Sambandar restituted the girl back to life by singing Poompavaipathikam (10 Thevaram hymns in praise Lord Kapaleeswarar). From the presence of bas relief of Sivanesan Chettiar on the pillar, you may guess the period of this temple. 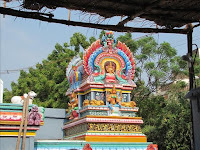 Goddess Vishalakshi, the consort of Virpaksheeswarar appears in a separate south facing sanctum which can be accessed through the above mukhamandapam. A small granite Nandhi image appear before goddess sanctum. It is customary to install simha image before goddess sanctums in later Chola period Shiva temples. Of course there are enough variations. There are shrines dedicated to Lord Selva Ganapathi, Lord Murugan, Lord Chandikeswara and Navagriha (associate) deities. The temple is under renovation. The tall five tier rajagopuram, with interesting colorful stucco images is being built at the southern gateway. The holy water tank with intact flight of steps on all four sides of the water body appear very quaint. Like here almost all the holy water bodies of the temples are subject to ill-maintenance and all intermittent toils in tank cleaning are worthless. 7. Sri Kapaleeswarar Temple, Sage (Rishi) = Kasyapa. Location: Mylapore Tank. 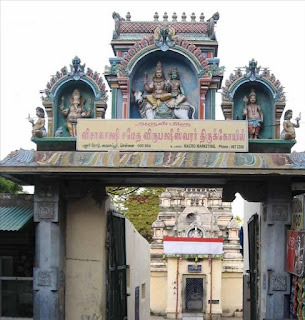 Sri Virpaksheeswara temple is the fourth among the Seven Holy Shrines (Saptha Sthana Temples) of Mylapore dedicated to Lord Shiva. Inscriptions commencing from 11th to 16th century A.D have been discovered, e-stamped, documented and published in the ASI / SII volumes. Some were inscribed inside the main sanctum and hence not accessible. Presently lithic inscriptions are damaged or discorded due to negligence or improper renovation methods. Dating back the reign of Vira Rajendra Chola (1063–1070 CE), the most ancient lithic document, records about the gift of two cows. Two important inscriptions one going to Pandya reign and the other going to the reign of Kopperunchinga I (1216–1242 A.D) the petty Kadava chieftain of the 13th century A.D. The fragmentary inscription, inscribed on the Mahamandapa pillar is accessible to all. It records the gift of gold in the name of prime deity for purposes of offering of flower garments, perfumes and for ablution of deities for one year. Though the 12th century lithic record was discovered on the mandapam floor and documented meticulously by ASI, the same has been covered with modern granite slabs. Much worn-out fragmentary record could have served as a crucial document to comprehend about the rich antiquity of Mylapore. Will the temple administrators and the government show firm commitment for preserving / conserving the inscriptions and the monuments for the enjoyment of present and future generations?